Kuala Lumpur Kepong (KLK) Bhd. Kuala Lumpur Kepong (KLK) is a large Malaysian palm oil company. It manages more than 200,000 hectares of palm oil plantations in Indonesia, Malaysia and Liberia, and is active in the manufacturing of oleochemicals in Malaysia, China and Europe. The company is active across the total palm oil value chain, but the revenue from its palm oil plantations and mills accounted for 76 percent of KLK’s total pre-tax profits in 2014. As the palm oil sector undergoes radical transformation, Chain Reaction Research undertook a deep examination of KLK. Over the past year, companies controlling over 90 percent of the global palm oil trade have committed to No Deforestation, No Peat, No Exploitation policies. We sought to answer the question: how does a company that has long operated in the shadows of an opaque palm oil sector now operate in a new era of increasing openness and sustainability? This report gives an overview of the company, delves into the environmental and social issues it faces, and presents a financial analysis of how sustainability risks may impact the bottom line. A draft version of the sustainability risks identified in this report was sent to KLK for review on November 24, 2014 and subsequently. KLK has not responded to Chain Reaction Research regarding these issues. Most of KLK’s palm oil products are made with untraced third-party raw materials. The vast majority of the palm oil products that KLK sells to its customers are derived from raw materials that come from third-party suppliers, which are not publicly disclosed. In 2014, KLK sold an estimated 3.5 million tons of palm oil products: about 30 percent came from its own plantations, while the other 70 percent came from external suppliers. However, this is not how KLK generates the majority of its profit. The revenue generation from KLK’s own palm oil plantations and crude palm oil mills (which overwhelmingly process palm oil fruit from KLK’s own plantations) accounted for 76 percent of KLK’s total pre-tax profits in 2014. While this percentage fluctuates as palm oil prices change (it was 58 percent in 2013), KLK’s own crude palm oil production operations are consistently the company’s main profit driver. Essentially, KLK generates a significant majority of its profits from its own plantations and mills where it could better control environmental and social practices and provide transparency. Yet those profits – and the company’s future as a whole – are subject to significant risk because of the non-transparent, non-traceable palm oil it introduces into its supply chain before it sells refined products to customers, which are not generating the lion’s share of its profits. These risks are especially acute because some of KLK’s biggest customers, such as consumer product giants Unilever and Procter & Gamble, have committed to source traceable, deforestation and exploitation-free palm oil. To maintain market access, KLK could commit to sourcing only zero-deforestation palm oil from third-party suppliers, or it could simplify its supply chain and retain control over a greater portion of the crude palm oil it grows and mills, giving it more transparency and accountability that would significantly mitigate risk. It could do so while retaining the most profitable elements of its business. KLK is not transparent on several key indicators, and has been implicated in some very serious sustainability issues in recent years. KLK cleared at least 24,000 hectares of forest in Kalimantan over the past seven years, and was found guilty of causing fires by a Sumatran court in 2014. The company developed an estimated 17,500 ha of carbon-rich peatlands in Sumatra and Kalimantan, which by itself causes 1.1 million tons of annual CO2 emissions – about the same as putting an additional 450,000 cars on the road. In addition, KLK’s concessions in Liberia are in areas with significant endangered chimpanzee populations. As KLK has attempted to enter regions such as Liberia and Papua New Guinea, the company has faced significant opposition from local communities. In Indonesia, there have been documented cases of severely poor working conditions and labour exploitation in the company’s workforce. Recently, KLK announced a joint-venture agreement with Astra Agro Lestari, one of the most irresponsible actors in the palm oil industry, which introduces still more risk for the company. In December 2014, KLK announced a “Sustainability Policy” that was widely criticized for not applying to the company’s suppliers, trading partners, or joint ventures, and it did not commit to using the standard approach for calculating High Carbon Stock (HCS) forests. In January 2015, KLK made progress by announcing that – as it conducts its own study – it will employ the industry standards for HCS developed by The Forest Trust, Golden-Agri Resources, and Greenpeace. 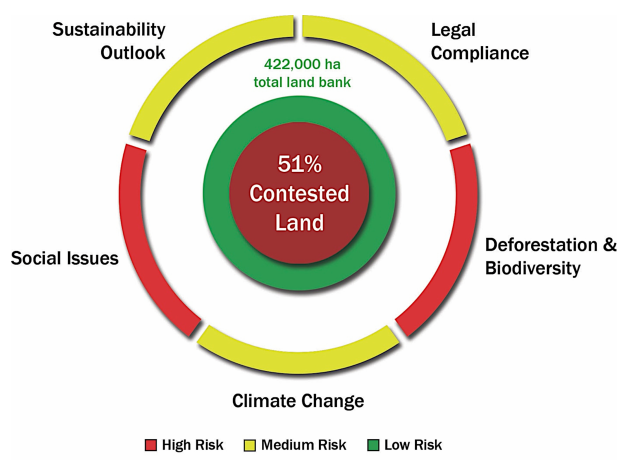 However, KLK’s policy still does not bind its suppliers and partners to any No Deforestation, No Peat, No Exploitation standard, which means that it does not address some of the most serious sources of risk. If KLK loses 20 percent of its total sales because customers with No Deforestation, No Peat, No Exploitation policies sever ties with the company, the net income margins would be lower than in the baseline scenario: 5.9 percent in FY2016 and 9.4 percent in FY2017. This would reduce Return on Assets (RoA) and Return on Equity (RoE), and therefore have a negative impact on the underlying value of KLK’s stock price. If KLK loses 30 percent of its existing customers because it loses its membership in the Roundtable on Sustainable Palm Oil, the company would see a net loss of RM 311.8 million in FY2016 and a small net profit of RM 101.8 million in FY2017. The net income margins would drop to -3.5 percent and 1.0 percent in FY2016 and FY2017 respectively. RoA and RoE would also drop significantly to -2.4% and -4.0%, respectively, in FY2016. Given the company’s low level of debt, the company’s debt-equity ratio could increase up to 0.65 in FY2017. Based on our analysis of these different scenarios, we conclude that KLK faces serious financial risks by failing to address the sustainability risks in its own operations and to its external procurement of palm oil products. Ignoring these issues could reduce sales, net income and net income margins of KLK significantly, which would affect RoE and RoA and would undermine the underlying value of KLK’s stock.